So the first time I had a kulfi was in the Maharaja (which, incidentally, does some of the best South Indian food I've tasted in England) in Liverpool. It made enough of an impression, that it stuck in my mind and when I wanted a quintessentially Indian dessert, I turned to it. 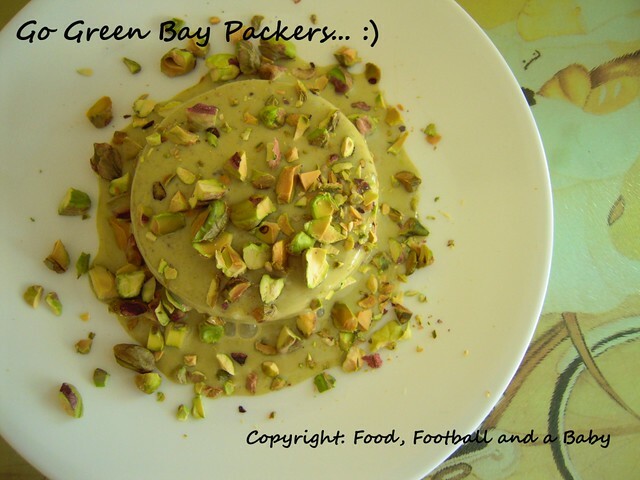 As with the Dal Maharani and Prawn Biriyani, this was part of our Superbowl party menu. It was also green in colour, so worked with the fact that Kay wanted the Green Bay Packers to win (they did and I am claiming it was because I served a green dessert). I looked for several recipes, but nothing that I found online or in my books really inspired me. For one, the majority had you stirring milk until it thickened, and while I am dedicated to my cooking, I am not that dedicated. So I took elements from a few different sources and came up with a version, that I thought would work well. It did! It was creamy and delicious with an intense pistachio flavour that was enhanced, and not overpowered, by rosewater and cardamom. I was worried that I may have to churn it to get a creamy texture, as traditionally kulfis are not churned. But I didn't have to worry, as the kulfi was so creamy, it literally just melted in the mouth. The chopped pistachios added a lot to the texture, and overall this was a real success and a dessert that I will definitely be making very often now. Using a powerful blender, grind the pistachios, rosewater, milk and honey or sugar to a very smooth paste. Put into the fridge. To make the kulfi, take 4 tbsp milk out of the 2 cups milk, and stir in the cornstarch, whisking to a smooth paste, adding a little more milk, if necessary. Scrape the condensed milk into a deep pan, and whisk in the milk, cornstarch mixture, half and half, crushed cardamom seeds and the sugar. Mix well, taste, and add a little more sugar if you want it sweeter. Remember, the condensed milk is already quite sweet. Over a medium heat, bring this mixture to the boil. Lower the heat a little, and cook, stirring often for roughly 15 – 25 minutes, until the mixture is fairly thick and coats the back of a spoon. It should have reduced by a third too. Take off the heat and refrigerate until cold. Once the milk mixture is completely cold, take it out and whisk in the pistachio paste, mixing well. 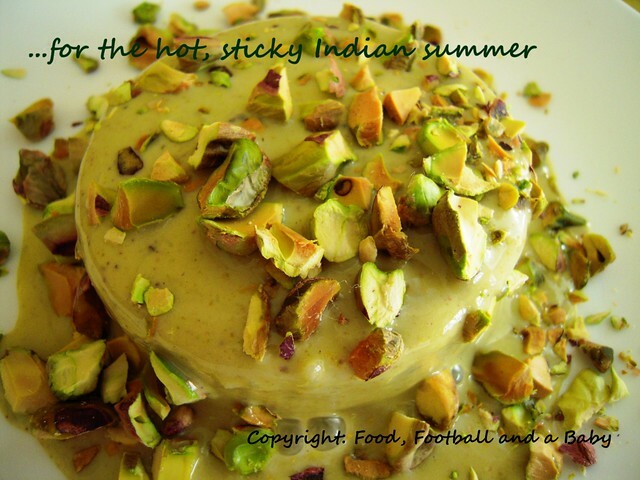 Pour into kulfi moulds or ramekins or a freezer safe container and freeze overnight or until firm. If you are freezing in ramekins, put them in a bowl of hot water to loosen the edges a bit, before unmoulding. Serve with the chopped pistachios sprinkled over, as garnish. 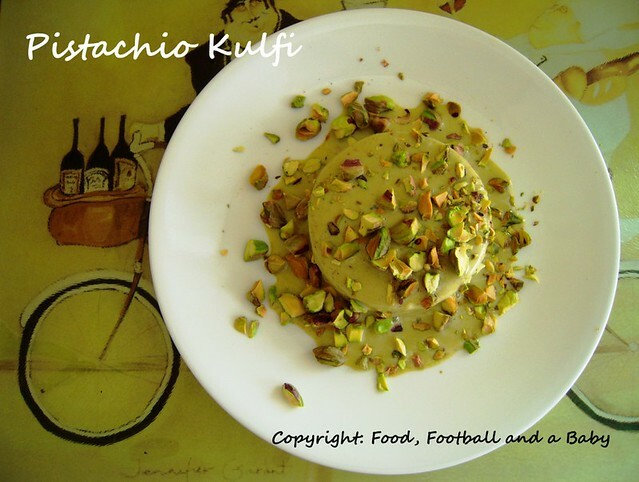 Note: For mango kulfi, replace the pistachio paste with 1½ cups mango pulp and 1 tbsp rosewater. Wow! 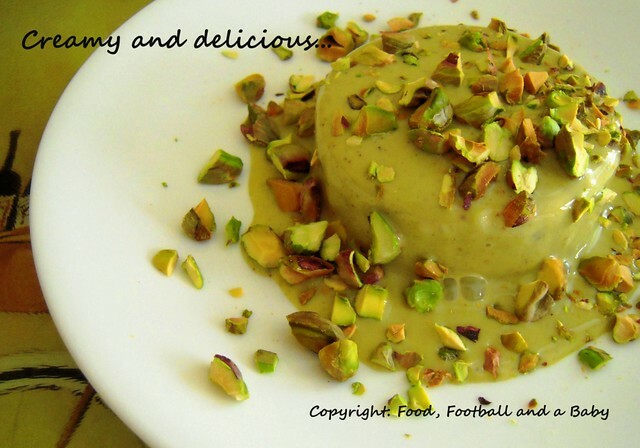 That looks gorgeous, I am not too fond of the kulfi for the same reasons you mentioned, but I think I must try this one! Thanks for posting! So glad you made it into the party this past week and sorry it took me so long to come by. This really looks like an exotic and delicious dessert. 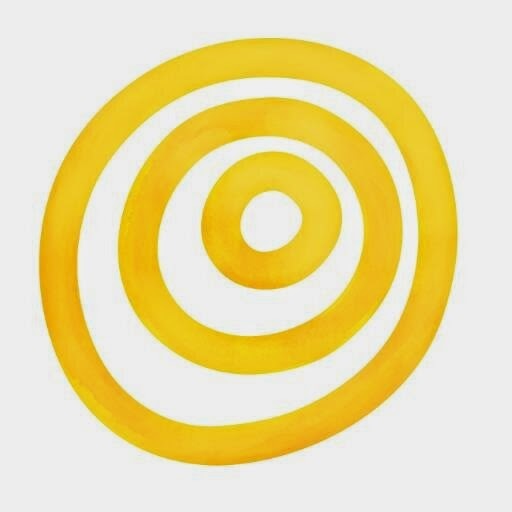 Thanks so much for linking it up.